One of my favorite swing dance related publications to read of all time is Cameron Seller’s “Reminiscing about Swing: When It was a Subculture“. Cameron gives amazing insight to what it was like to become a member of the swing dance community during the late 90’s in Washington D.C. with all that entailed from finding new venues, meeting new friends, to competition. What stood out to me though was this article was written on a very personal and honest level. As a newer dancer when I first stumbled upon this a few years ago and took a lot of the perspective in it to heart. I actually (in retrospect unecessarily) set myself as a rule after reading the article that I would refuse to buy any dance shoes until I won my first competition because of this article. 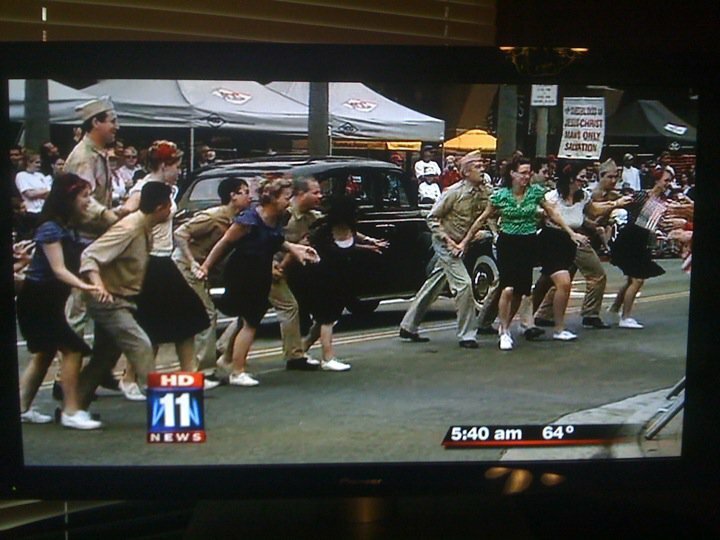 New rule, you aren't a real swing dancer until you get featured on Faux News. So this post I am going to have a change of pace around here. Instead of me rambling on about something, I want to hear stories from you guys. Exciting right? What I to read from y’all is similar to what Cameron wrote in his article and what many people have done at http://iamlindyhop.com/. I want you to post in the comment section your story about joining the “swing cult” known as the Lindy Hop community. It can be any length you like, however if you wish to to make it as long as Cameron’s feel free to. If I get a reasonable response I’ll work quid pro quo and write my own personal experience as a new blog post. I look forward to reading all of your responses! This entry was posted on August 8, 2011 by Apache. It was filed under Dance . While not quite exactly what you may be looking for, here is something I wrote a while back when I took a stab at the 30 Day Lindy Hop Challenge. I don’t know if I will have the time to write something up more in line with what Cameron wrote. Here are a few of the highlights of what came after though. -Walking uphill through the snow to get to lessons, both ways! (No I am not exaggerating). -Hollywood dancers gain a toe hold in a very Savoy town. Snobbery ensues. -Hot new teachers come to town and upset the status quo. -Ogden and Amanda share their new routine for ALHC 2001, and most of Boston sees Blues for the first time. When I moved to Nashville in 2006, I knew one person going in – the guy I was dating at the time. And we hung out with the guys he worked with, because everyone was a transplant and no one actually knew anybody else. He and I happened to live a few miles from a dying mall – which was being taken over by small businesses looking for cheap rent. Conveniently, one of these small businesses was a dance studio, and in 2007 we sucked it up and started taking classes. And more classes. And seriously more classes. I think initially we were taking group classes 6-8 hours a week. Eventually the teachers convinced us to come out social dancing, and that was the hook. Within a few months we were travelling, dancing, and finally socializing! I started dancing because I was bored, because it was easily accessible (talk about lucky, I haven’t met anyone else who’s been through the same Lindy Hop childhood), and I kept dancing because I finally found an activity that allowed me to pick through an already existing social group and choose my friends. There tends to be a break between when a person starts dancing, and when they start Lindy Hopping. I don’t merely mean there’s a difference in the steps they’re doing, but I think there is an emotional change behind the decision or progression to being a Lindy Hopper. My first night out swing dancing was at Memories in Whittier, almost two years ago. I had no idea what swing dancing was about, aside from the outfits other girls at my college had shown me when they were going out. I thought it was kind of stupid (what did I know, I’d never tried it) but my roommate and some visiting friends were going out on the town so I joined. I won’t even tell you what I wore like, because I’m saving that for my own blog post, but it involved four-inch heels. Like I said, I knew nothing. However, whether by actual knowledge or because they were flirting, by the end of that night I knew that at least a couple of people thought I was a good follow (at low-level East Coast). Protip, telling me I’m good at something is a really good incentive to get me to do more of it. I met someone a few weeks later who was willing to teach me steps with connection technique, and from there it was a matter of weeks before I was addicted to learning. I’ve found that, at least in the SoCal scene, the more willing you are to learn and the more interested you are in improving, the more welcoming the community is. Now that I’m a part of that community, I want to help interested people learn and improve. Ideally, everyone would want to learn Lindy Hop, but in reality, not that many actually want to progress to another level. The paradox of an inclusive community and an exclusive scene is something I’ve discussed with a lot of people, as many beginners encounter a reluctance from the more experienced when it comes to including them. I think it may be that a lot of people don’t want to “waste their time” giving instruction to people who aren’t interested in more than the novelty of dancing. Now I’m just spitballing about the community… but it’s because this community is what keeps me dancing. The people I’ve met and who have become my support structure are the greatest blessing I’ve ever gotten. Hey thanks for the plug of http://iamlindyhop.com !! I’m sorry it has been slightly broken for so long.. I will definitely need to fix it soon (I hear there are issues with people adding themselves) . Anyhow, I hope to fix it soon. It was a site born out of love for our awesome dance and I appreciate the plug 🙂 ! !